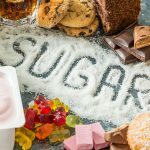 Sugar is a key ingredient for most processed foods and sweetened beverages, as an ingredient it adds flavor and can withstand the demands of industrial food preparation – and most of all, it is low cost. However, although the industrialisation of food has meant greater convenience and availability, these advantages have come with a high price for the consumers. Over the past few years, more studies have shown the link between high levels of added sugars – defined as ‘all sugars added in processing or preparing food – with cardiovascular disease. In short, consuming high amounts of these added sugars – which are often hidden in (processed) foods you would not expect to find them – significantly increase your risk of death. As the evidence stacks up, the US and UK dietary guidelines must adapt accordingly. It may well be that saturated fat is not the demon we thought it was, and refined carbohydrates, added sugars, are the real enemy in the fight against CVD. Yang Q, Zhang Z, Gregg EW, et al. Added sugar intake and cardiovascular disease mortality among US adults. JAMA Intern Med 2014; 174(4): 516-24. Rahman I, Wolk A, Larrson SC. The relationship between sweetened beverage consumption and risk of heart failure in men. Heart doi:10.1136/heartjnl-2015-307542. DiNicolantonio JJ, Lucum SC, O’Keefe JH. The evidence for saturated fat and for sugar related to coronary heart disease. Prog Cardiovasc Dis 2016; 58(5): 464-72.